We knew the dip coming, but what’s next? The S&P 500 stumbled Tuesday, breaking an eight-session win streak. Investors were unnerved after Trump announced a fresh round of EU tariffs, reigniting trade war fears. And right on cue, the EU said it was ready to implement retaliatory tariffs against the US. So much for the trade situation getting better. But even though trade war headlines flared up again, the index shedding 0.6% is a fairly benign response. It certainly doesn’t measure up to the fear that gripped equity markets last year. Today’s muted reaction is not a surprise for those of us that have been paying attention. We know most owners who fear Trump’s trade wars bailed out a long time ago. And not only did these fearful sellers already abandon the market, they sold to confident dip buyers who demonstrated a clear willingness to jump in front of these headlines. If these confident dip buyers weren’t scared then, there is no reason to think they will get scared now. No matter what the cliches say about confidence, confident owners don’t sell, and when they refuse to sell, supply remains tight. While tight supply is preventing any of this year’s modest dips from growing into something bigger, supply is only half the equation. The problem we is as prices approach last year’s highs, a huge chunk of demand has already been satiated during this amazing run. While most of this year’s rebound was fueled by “less bad than feared”, as we approach the old highs, “less bad” is no longer good enough and we need headlines to shift to “good” to continue marching higher. 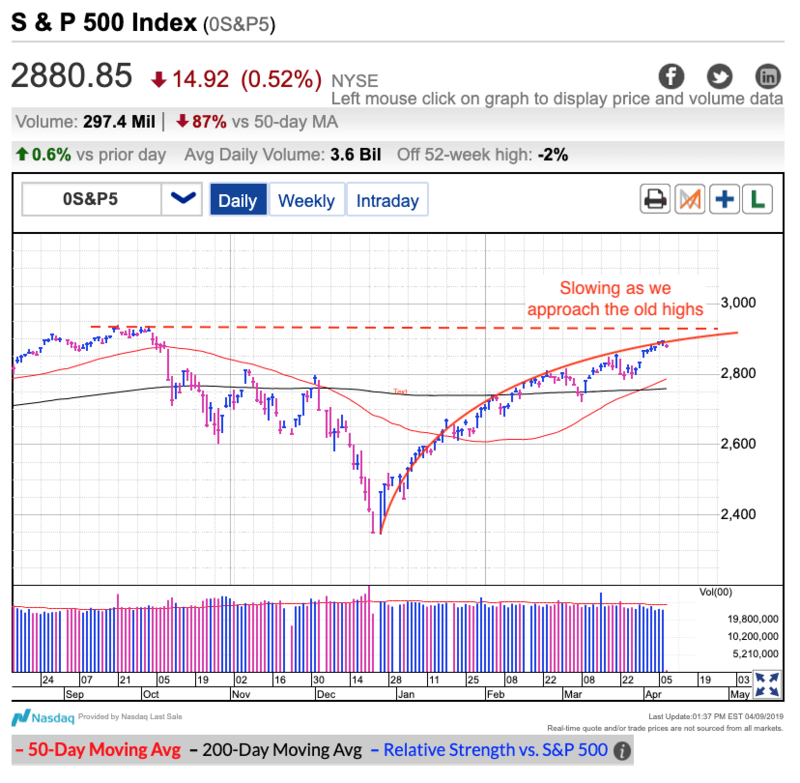 “while the path of least resistance remains higher, the rate of gains is clearly slowing. The easy money has already been made. Now things get a lot more choppy. And choppy means challenging. Breakouts fizzle and breakdowns bounce. Even though most of us understand the markets move sideways more often than they go up or down, almost everyone comes to the markets with a preexisting bias. Either people are bullish or bearish about current levels and they believe any move in their direction is the real deal. If they are bulls, they buy the breakout. If they are bearish, they short the breakdown. But not long after they react to the market’s move, it fizzles and reverses. Once prices start moving against these reactive traders, they lose their nerve and pull the plug. Buy high, sell low is a horrible way to trade. Unfortunately, most people fall for the market’s tricks and end up losing money. This market is transitioning to more sideways than up. That means we need to be more careful with our purchases and stop-losses. In fact, for most people, they would be better off not trading this chop. Either buy-and-hold your favorite positions and wait for the slow grind higher to continue, or stay out and wait for the risk/reward to skew more in our favor.